We met Outsider back in March at the inaugural Irish Music Party Showcase. 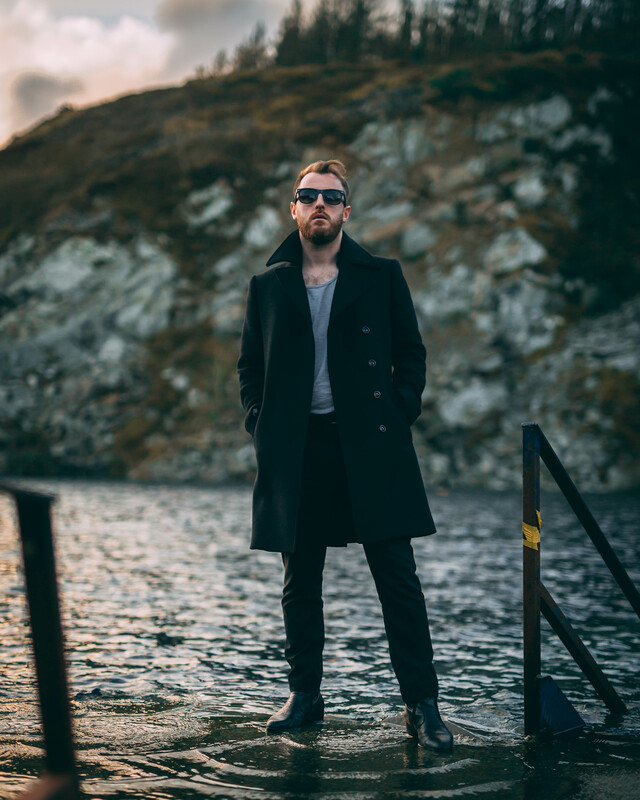 Multi-instrumentalist singer songwriter Seán Ó Corcoráin is originally from Tipperary, Ireland, and his new song, ‘Young Gods Of Na Sionna’ is the follow up to his single, ‘Míol Mór Mara’, which was the first single featuring a song as Gaelige on the FIFA Soundtrack. It’s also seeing frequent play on Match Of The Day. ‘ is connected to ‘Míol Mór Mara’. Both of them definitely owe a lot to Bruce Springsteen; there’s something about Seán’s voice that brings this up, and that’s even without him saying that ‘Young Gods Of Na Sionna’ is a direct homage to ‘Dancing In The Dark’, a song which formed the soundtrack of his life, and comes with a very simple video, focusing on Seán running, in the dark. ‘Young Gods Of Na Sionna’ is written about a river in Ireland, The Shannon, which runs through Seán’s home county of Tipperary. The River Shannon sadly has seen a lot of suicide, particularly in the Irish economic crisis of the late 2000s. Seán too had been affected. “I wrote ‘Young Gods’ about a river in Ireland where a lot of suicide happened during the economic crisis… but ya know I realised deep down it was about my own suicide attempt when I was 19. I realised I was not mentioning it because of fear. What people might think of me. My friends, my family, my parents who do not even know about it. The lines ‘You know I didn’t think that, I didnt think of anything, I thought of love’ are based on my thoughts the seconds before I was about to go through with it. I actually hate talking about this. It is a dark feeling but I realised artists who write about suicide etc and don’t mention their own experiences, can fall short of the mark. I hope it helps some kid that I am saying this, ya know. Bruce really gave everything. Music is really that powerful, and Dancing in the Dark was that place I could to go to be understood. Oh brothers I’m not lost, but I came that way”. Opening with the words ‘I put my body on the sleepers/There was a stranger in my blood’ we’re left in no doubt as to what was intended; the lyrics show a young man whose relationship has broken up and he’s at his absolute wit’s end, with no clear solution apart from suicide. ‘Sometimes she eats her young/they don’t wash away the blood’. Thankfully the singer doesn’t choose that way out – ‘Oh brothers I’m not lost/but I came that way’. The River Shannon takes its name from the Celtic goddess, Sionna, who in seeking wisdom at the well of knowledge, slipped in, angering the pool, which rises up over her and sweeps her out to sea, thus creating the river. Such sadness therefore that a river whose birth was told in legend as coming from an accidental drowning, should now be a place known for frequent suicide – so much so that in Limerick they introduced a patrol, Limerick Suicide Watch (LSW) back in May 2016. The group have to date saved more than a hundred lives. It’s a very sad statistic that suicide is the biggest killer of men under 45. It’s been described as a “silent killer”. Over the past 30 years, the number of men taking their own lives in the UK and Ireland has risen by a mindblowing 82%. In the UK, in 2016 alone, of the 6,188 reported suicides, shockingly 4,997 of those were men. What can be done about it? Seán sees music as playing a very powerful part in helping the crisis. For whatever reason, there’s been a mindset that has arisen that men don’t express emotion, that it’s seen as weakness. On the contrary however, being able to express your emotions goes a very long way to making you a balanced human. It’s beneficial for your health: quite apart from helping prevent suicide, it can also go a long way to preventing stress related illnesses – dare we say even strokes and heart attacks. ‘Young Gods Of Na Sionna’ by Outsider is out tomorrow. You can find out more about Outsider online on Facebook, Twitter, Instagram, YouTube, and Snapchat.